It sounds like an impossible feat: pack for an 18-day trip in a single carry-on-sized suitcase. But Social Media Specialist Melissa proves that it's possible, as she did just the thing on her recent trip to Eastern Europe. Offering 100+ tours to all 7 continents, Go Ahead helps you discover the world one journey at a time. Young woman standing on her knees on overfilled suitcase, trying to close it. So, how'd she do it? Follow her tips below, then try them out on your next trip! "I wear a ton of black, so this was an easy choice. I packed regular and colored denim and plain, solid tees in white and black that I knew would mix and match well. For sweaters, I brought two in gray and black, which I knew would work with all of the other colors and pieces I was bringing." "I made sure all my tops were super light fabric that would dry quickly and easily when washed in the sink. While I had the benefit of warm spring weather, you can pack for colder climates by using fabrics like merino wool or cashmere, which offer a ton of warmth with little added bulk." "I swear, this really works! It takes some practice and rearranging, but it saves a ton of space. Lay a few pieces on top of each other and roll into a cylinder. You can pack these rolls on top of each other and easily fit them into the tiny awkward spaces of your carry-on." "Stuff your socks in your sneakers, wedge your shoes into the side of your suitcase, and fill up extra pockets with smaller items." "Camping/outdoor stores will often have pocket laundry wash that you can pick up for a few dollars. 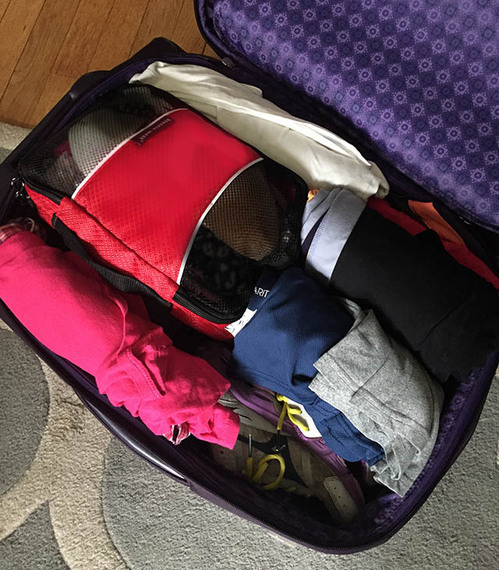 It takes up almost no room in your suitcase and will allow you to wash a few things in the sink. If you're in dire need, most hotels offer same-day laundry and dry cleaning services that are worth the money if you need some heavy-duty cleaning." "This can be a challenge come winter and for those of us who love shoes, I know! But you will need fewer shoes than you think you need, I promise. Have one pair that you plan to make your go-to pair of walking shoes; it helps if they can be dressed up or down if you need to. I love Toms in solid colors--they're super comfortable to walk in but are dressier than a pair of running sneakers. Pack a pair of comfortable flats or sandals in your suitcase, and if you absolutely need it, one more pair of shoes, whether it's boots or hiking sneakers. The most important thing is that ALL of the shoes you bring are comfy when you're on your feet for hours." "Especially when it comes to footwear, you might be sweating on your way to the airport, but it'll save you precious luggage space. Also: layer, layer layer!" "If you don't plan to check your carry-on, make sure your additional personal item--whether it's a laptop bag or a small purse--has enough space to stash a change of clothes and any toiletries you might need. Aside for being great for touch-ups on the go, this will save a little more space in your actual luggage." "I decided to check my carry-on so I could bring another pretty-empty backpack in order to bring home souvenirs. Even though I decided to check it, forcing me to bring fewer items (and a smaller suitcase) made it easier to drag around my carry-on once I got off the plane." "If you plan on bringing home a lot of souvenirs, try to bring clothing that's on its last legs and you don't mind getting rid of at the end of your trip. You can find a clothing donation box in the city or simply dump it in the trash, giving you a little more room for all the new items you pick up." What are your packing tips for a long trip? Share them in the comments!